Mary was the eldest daughter of James VII by his first wife. On the instruction of her uncle Charles II, both Mary and her sister Anne were raised Protestant to protect them from the unpopularity of their father’s Catholicism. Mary married her cousin William, Prince of Orange in 1677 but the marriage produced no children. 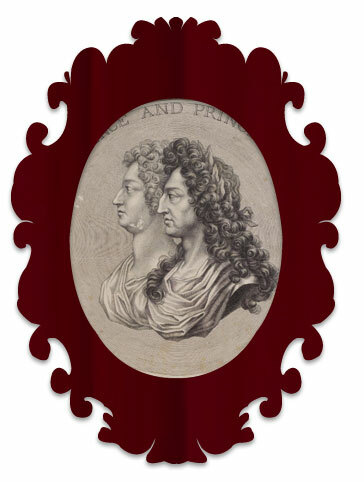 William’s mother was sister to both Charles II and James VII but despite the close Stuart connections there was often tension between William and his uncles. The limitation of French power was the driving force in William’s life and he began to see that the divisions caused by James’s policies would prevent England from acting as a counterweight to French ambition. From 1687 tension between James and William increased. Politicians began to plot with William’s agents, who made clear the Prince’s opposition to James’s attempts to overturn anti-Catholic legislation without the approval of Parliament. Following William’s successful invasion, legitimised by an invitation from seven English lords, he acceded to the throne with Mary in a unique coronation that recognised a dual monarchy. A foreign king was not a popular choice but Mary provided continuity of the Stuart line.